Thobias Minzi was born in Iseni village in the district of Mwanza in northern Tanzania. He started Primary School I Iseni in 1994 and completed in 2000. 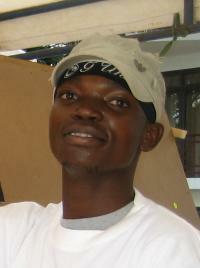 Later he came to Dar es Salaam where he paints in abstract style. It is said that he is inspired by other Tanzanian artist named Haji Chilonga. Minzi is a self taught artist and he paints in realism, cubism and abstract. In 2002 he joined Namanga Art Studio (group of painters) where he works now. Minzi´s paintings are very popular abroad and many people have carried them to Europe while on tour in Africa. But Minzi himself never travelled for any exhibition abroad. Instead he showed his art on many places in Dar es Salaam such as American Embassy, National Museum or EASTAFAB. SEE PAINTINGS OF THOBIAS MINZI! GO TO PERSONAL BLOG OF THOBIAS MINZI!